Just like any young Filipino couple, Karylle and Yael live a hectic and active lifestyle. With their life goals, they know that breakfast is very important. It’s the time they get their energy for a long list of activities ahead. “Breakfast is sometimes the only meal we get to enjoy together with our many commitments. This is why belVita breakfast biscuit is ideal for the lifestyle we have. We try to eat a balanced breakfast every morning. So we pair belVita with a piece of fruit and a glass of milk and we know we have everything we need to jumpstart our day,” Karylle shared. As for the taste, Yael likes how tasty and easy it is for him to have his breakfast. “I like belVita not only because it is convenient to eat but also because it’s really yummy. It’s easy to reach for and it fills me up just right. When I want a delicious, healthy and convenient breakfast, it’s the perfect go-to,” Yael mused. 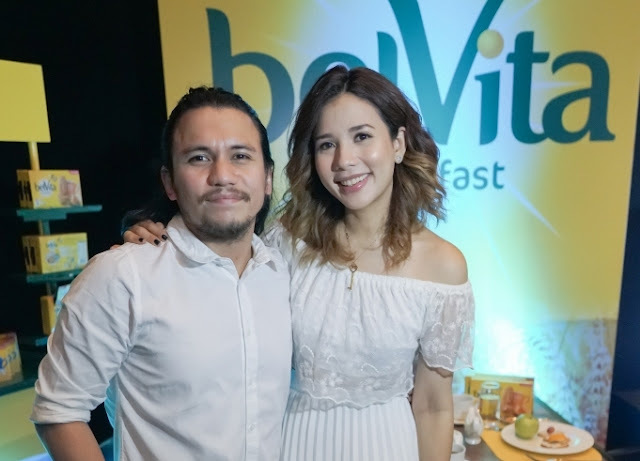 With their jampacked days, Karylle and Yael turn to belVita as their breakfast staple, making them the perfect couple to introduce and endorse the brand to the Philippine market. Several studies confirm that this accelerated shift to convenient well-being products in the snack industry is well-founded. Reference from the Philippines’ adult energy and nutrient intakes study published in the Federation of American Societies for Experimental Biology (FASEB) Journal in 2013 identified 1 out of 5 adults in Philippines tend to skip breakfast. It is also noted in the Food and Nutrition Research Institute 2013 Dietary Survey that only a third or 31.5% of households in urban areas are able to meet their energy requirements for the day. And in the National Capital Region, 1 in 10 or 13% of households consume their breakfast outside their homes. “Belvita is specially designed for breakfast,” said Princess Landicho, belVita Brand Manager. “BelVita breakfast biscuits are made with whole grain cereals, which include whole wheat and oat, and are fortified with vitamins and minerals such s Vitamin A, B1, B2, B3, D, calcium, iron and zinc. And thanks to more than 15 years of research, belVita is also baked using a special gentle baking process, which helps to preserve the nutritional quality of our cereal ingredients,” Landicho added. First launched in 2011 in the United Kingdom as a breakfast biscuit, this global breakfast icon is sold in more than 50 countries. Locally, belVita is available in two flavors: Milk and Cereal, and Honey and Chocolate. BelVita is also purposely packaged to help consumers exercise portion control. It is available in a 4-pack box with an SRP of P30.50 and the single 20g pack worth P8.25 that contains two delicious and filling biscuits. Delicious and nutritious, each piece can be part of a convenient breakfast to give energy for a packed day ahead.